Name the single most influential event in the history of the NHL. Some would say collapse of the PCHA in the 1920s, or the television revolution that started in the 1950s, or the Soviet style play in the 1970s, or maybe even the lockout of 2004-05. The Great Expansion: The Ultimate Risk That Changed the NHL Forever is a fantastic and in depth look at every aspect of the bold move - from the preparation and logistics to the team selection and player draft to the long term impact. At nearly 250 very well researched pages, this is easily the most expansive text ever on this subject. It makes for a fascinating read, not only because of the importance of the event and all the logistics of it all, but because it takes back to a much simpler time that set the stage for today's big business NHL. I especially appreciated the research into why each market was selected, as well as the individual chapters on each of the new teams and the challenges each faced. The power brokers are profiled and the backroom deals revealed. There are some pretty surprising details behind the origins of these franchises. Near the end of the book Bass looks at expansion's impact on competitive balance and equality, as well as comparing NHL expansion to that of other major league sports. All of that provides interesting reading, but then book deviates from its course right at the end with somecritical commentary on the NHL's more recent expansion and the possibility of future NHL expansion. It was March 1965 when Clarence Campbell, president of the National Hockey League, emerged from a long board meeting and announced that the NHL would double in size beginning with the 1967-68 season. Fans loyal to the "Original Six" were furious. Owners were irate. 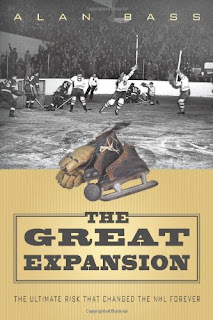 In The Great Expansion: The Ultimate Risk that Changed the NHL Forever, hockey expert Alan Bass profiles the power brokers and provides an in-depth study of the decision and its revolutionary impact on the game. 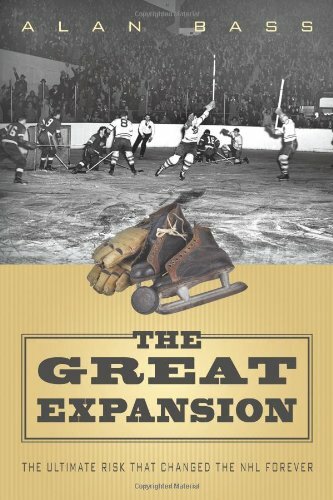 The Great Expansion: The Ultimate Risk that Changed the NHL Forever is not only an important documentation of Clarence Campbell's bold move of doubling the number of NHL franchises, but also provides an unforgettable look back into the history of pro hockey in North America. Bass has done a solid job presenting the book through the self-publishing service. Not having a major publisher accounts for the lack of photos accompanying the text. But an interested reader will not even notice as he or she will be instantly taken by well written text. I wish Bass had the marketing power that a major publisher could provide, because this really is a good book that hockey fans will enjoy. Incredible read. This book sheds light on a lot of the questions I had about the league specifically and how we got to where we are today. It is clear he did his homework in writing this one. Cant wait for his next book!